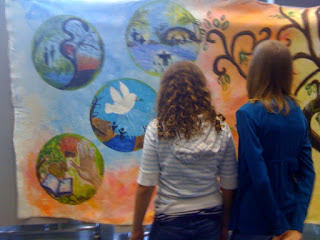 Last Sunday at Crosspointe, it was my turn to paint again. Knowing I'm painting makes me "see" the symbology as it flows throughout. I mentioned in the last post about the mural that the symbology as thorns as part of the curse in the garden and a crown of thorns for Jesus really jumped out at me. 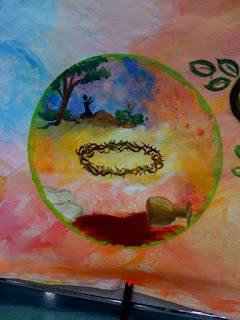 As David-the-Artist Pastor went through the Seder, the symbology of creation, fall, restoration and deliverance was overwhelming. Of course, the best part of the painting is that people actually come and look at it. It engages. Which is sort of wonderful.